Volvo S80 Pros and Cons | Page 1 of 1 | Why Not This Car? What drives people to buy (or not buy) a certain car? 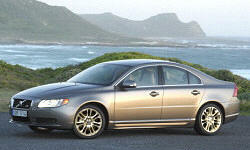 TrueDelta's members share Volvo S80 pros and cons based on their real-world driving experiences. Surprisingly quick response to throttle. Can be manually shifted. Handles well in autocross. The crash test ratings are the highest available. The brakes have a great feel and stopping power is more than adequate. 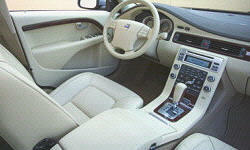 Once again the S80 has a very executive car design, the interior is very refined and has a very spacious design. All controls are within reach and have a positive, quality feel to them. I do like the black leather with the dark, polished wood trim and steering wheel. The glove box is huge and there is adequate storage for small items. The seats are beyond comfortable, not to mention the vented seats are gonna be great in the summer. The styling overall is really impressive and just surrounds you in luxury. Brakes well, as large a disc as on my Previous Ford Crown Victoria ;has amny more Airbags then any comparable product. Plus has side door protection. After a very serious crash in my previous 1990 BMW 525i in which is was very lucky to have lived, I did extensive research about auto safety. The S80 is the safest (by ratings) large sedan sold in the US. It is one of the safest cars of the world if not the safest. As a person who has to travel a lot on the highways for business development, I was highly impressed by braking distance, control and all the safety features included in the car as standard. Never felt quite settled. Busy, noisey, suspension. Always felt that the suspension was working very hard. Excellent braking. One of the safest cars around.